Many of you, like me, prefer to have your DOCK over to the right side and hidden until you roll over it. After all, it does make a lot more sense than at the bottom -- you've got plenty of horizontal space, but very little vertical. The folks at Code529 also figured that out and have launched SideFolders! SideFolders 1.3.1 is a file management utility for Mac OS X that gives the user of this Mac app instant access to all its files and folders. SideFolders hides itself on the left or right side of the screen and pops up when the user moves his mouse to the edge of the screen. Once open the user can easily access his files. Besides showing all devices and favorite places SideFolders also gives the user access to files he recently worked with or downloaded. 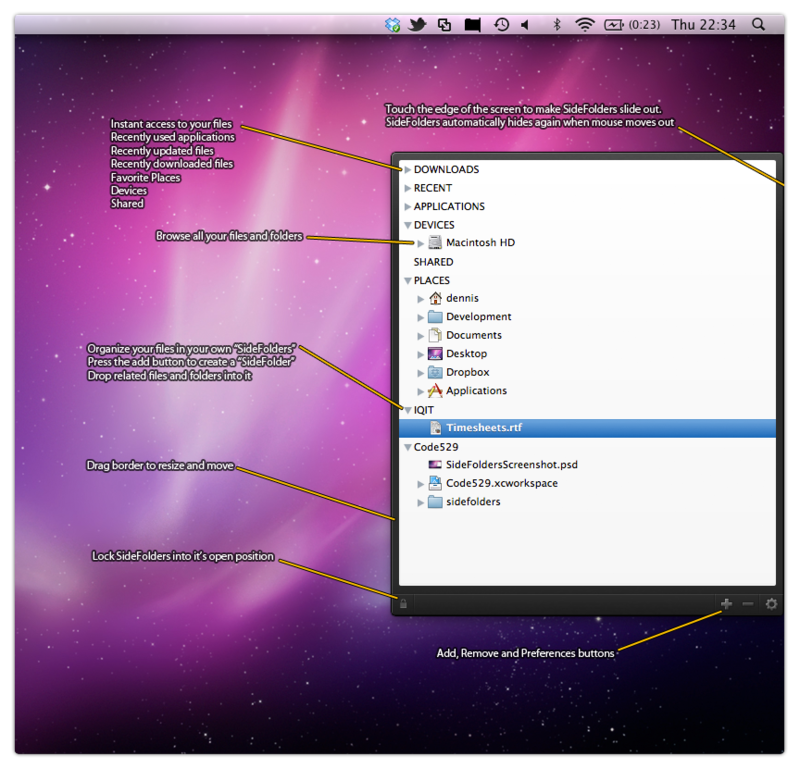 SideFolders also allows the user to add files and folders to the SideFolders view so they can be accessed instantly. Located in Sint-Niklaas, Belgium, code529 was founded in 2010 by Dennis Van Roeyen. Code529 develops applications for the Mac and iOS platforms. All Material and Software (C) 2010-2011 code529 / All Rights Reserved. Apple, the Apple logo, iPhone, iPod and iPad are registered trademarks of Apple Inc. in the U.S. and/or other countries. Puts an ULTRA dock over to the side of your screen, ready for action! Clone that SD Card and don't look back . . .